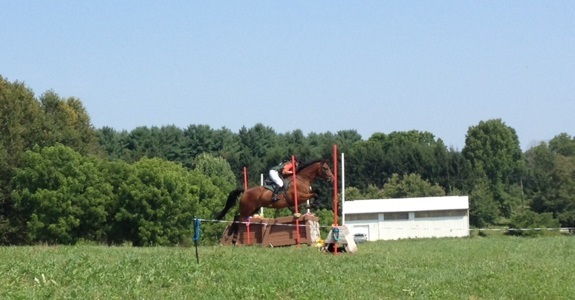 I spent yesterday morning and afternoon at Full Moon Farm's Aloha Horse Trials. Guys. This was maybe the COOLEST event I've ever attended - it was Hawaiian themed and competitors were very strongly encouraged to dress the part. There were even leis in the registration packets!! I should have taken pictures of the jumps too bc they were off the wall and covered in decorations. Think: beach towels and inner tubes and surf boards and pool noodles. EVERYWHERE. see the lei threaded through Wick's brow band? The divisions were pretty legit too - with a tight and winding stadium course and level appropriate questions. Meaning plenty of full-height obstacles for each division (plus there were 3 sub-BN levels). Definitely a solid venue for pairs looking for more mileage! Part of me was bummed about not bringing Isabel too... but seeing as neither of us had done anything for a week and I was battling the aftermath of 4 nights on Bourbon St... well, it seemed prudent to just serve as groom for the day lol. It was a popular event tho - meaning I had the pleasure of watching both trainer P from OF ride her novice horse, and Dan run through with a couple of his own. We're definitely spoiled in this area with how may pros can be found at any old event schooling their horses. 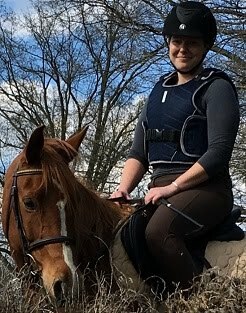 Naturally I then felt all inspired to get back into the saddle for Isabel's first ride in a week. I figured we wouldn't do anything too crazy - just push all the buttons to make sure they still work, and get her back into a working frame of mind. But sadly it was not to be as there was just one dark ominous cloud in the otherwise blue clear sky. And it was directly over our farm. Le sigh. The forecast wasn't calling for rain so I hoped it would pass. Once it lightened up off we went... only for it to start absolutely DUMPING on us about 15 min in. that looks awesome. i want to go to a themed ht! That HT looks like so much fun, what a fun concept!! I love Full Moon Farm. I did their Long Format 3 Day a couple years ago, it was a blast (and also very educational). If I still evented, I'd definitely go back! Oh, Full Moon. Memories! It was only about a 15min drive from where I was a working student. Coolest theme for a summer event ever. That is my type of HT! What a crazy and FUN looking show! Stupid rain... I also got poured on this weekend. Never heard of a themed HT before but I love it! I have a waterproof saddle cover with openings for stirrups and force my ponies to ride in the rain, ha! #allweathersport But I understand her curling to get her face out of the rain. yea we certainly don't shy away from weather, whether schooling or showing (as has been very well documented these last two months bc omg so much rain!) - but yea it was our first ride back from a week, she was trying and being good, but also not super pleased with the downpour. some battles are not worth picking and i had only wanted a light ride anyway. oh well! Sounds like a fun show! Too bad it rained when you rode though! That's a really cool idea for an event! I once dressed Simon up in full Hawaiian gear. You two would have fit in perfectly!! Love Isabel's face! She is priceless! The HT was so fun!! Lol she certainly expresses herself! And I'm so glad you had fun - you guys were great! 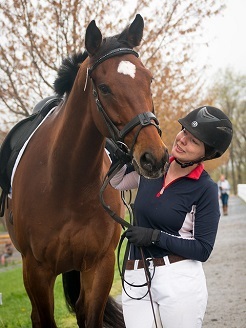 I have had the two best dressage tests of my life, on one of each of my previous arabs, in the pouring rain. Nothing motivates an arab to keep its nose out of the sky more than fear of drowning. Very true! And Isabel is certainly capable of buckling down to work in the rain (look no further than our last event at fair hill for evidence of that!) but I really saw no value in fighting with her to unpin her nose from her chest in the pouring rain after a week off work. Might as well try again another day in friendlier circumstances! oh wow, that is a great concept! I would love to go to a show like that! Oh my goodness. That event looks fabulous. I wanna go. it was so much better than i could have imagined!!! You guys will be back to rockin' out on the XC course in no time! july confo - just under the wire! Waredaca stadium + xc pics! fun times in DC with Austen + Pig!